What does Weymouth have in common with Newmarket, Douglas on the Isle of Man and George Town in Malaysia? All three have clock towers that were built in celebration of Queen Victoria’s jubilees – major anniversaries of her ascension to the throne. On 16 June 1887 Weymouth, along with the rest of the country, celebrated 50 years of Queen Victoria’s reign. The half century had seen massive changes in the town including the arrival of the railway, the building of Nothe Fort and considerable growth in population. Banquets and street parties, paid for by a Jubilee fund, allowed everyone to join in the festivitiesand it was decided to spend the cash left over on a town clock. Or at least, on a tower. The clock itself was paid for by Sir Henry Edwards, Member of Parliament andgenerous benefactor to several local good causes. The clock was originally constructed on a stone platform that projected out from the Esplanade. But as the road was widened in the 1920s, when the area around the clock became absorbed into the main body of the Esplanade. 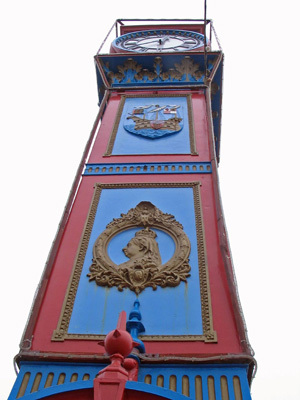 In addition to being both a local landmark and a timepiece, the clock also provided the colours for Weymouth FC. According to Nigel Biddlecombe’s history of Weymouth football club, when the club was founded in 1890 a Fred Pates suggested that the team colours be terracotta and pale blue. He’d just been given the contract to paint the clock tower in exactly those colours. What significance of terracotta and pale blue is to Weymouth before that date, I don’t know. The town has had a coat of arms since 1592 but do those colours feature strongly? That’s a detail I haven’t researched. If you have any stories about the Jubilee Clock, please share them in the comments. The civic arms are in the shield-shape on the clock, visible in the picture you’ve used.